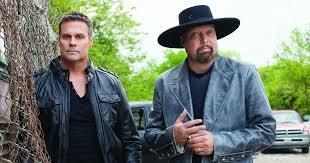 Platinum-selling Montgomery Gentry visits the F.M. Kirby Center on Friday, May 18 at 8:00 p.m. in an emotional return to the stage for Eddie Montgomery, touring for the first time without the late Troy Gentry. Tickets go on sale this Friday, February 2 at 10:00 a.m. and will be available at the venue box office, online atwww.kirbycenter.org and charge by phone at (570) 826-1100. A special Kirby Member Pre-Sale will begging this Wednesday, January 31 at 10:00 a.m.
“I’m anxious to get back out on the road and play some new music for our friends and fans,” reveals Montgomery. In honor of Gentry and their nearly two decades-worth of chart-topping Country music, guests can expect to hear their greatest hits mixed with anticipated Here’s To You tracks during the expedition. They’ve notched five No. 1 singles (“If You Ever Stop Loving Me,” “Something To Be Proud Of,” “Lucky Man,” “Back When I Knew It All” and “Roll With Me”) and were inducted as Grand Ole Opry members in 2009. The duo, whose trademark sound combined Southern Rock and Country, achieved Platinum certification on three of their albums and Gold certification on three others.